This issue of Hyakunin Issho is quite a 'catch-up' issue ... we pick up a couple of threads that have been dangling too long! Perhaps you've been wondering what happened to the 'Studio Diary' series that appeared in this newsletter a while back. Did I abandon work on the new workroom downstairs? Of course not! The trip overseas earlier this year did set my schedule back a bit, but this summer I have made some progress on the construction work, and you can read about it in this issue (this photo was taken looking out the window from my new 'workbench'). It's also been a long time since we had news of my daughters' activities; they've both been very active recently - too much so to send their own news reports for us to read - so I filled in for them to bring you up-to-date on what they're up to these days. There is no 'catching up' necessary for the other stories - Sadako and I both have fun writing our own columns, and always send them in on time! I hope you can find something of interest in this issue of Hyakunin Issho! 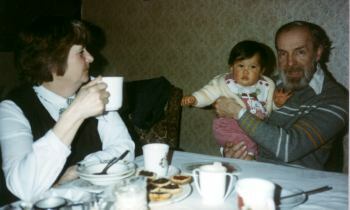 In later years when we talked with people about this trip, many of them expressed surprise that we had travelled so far with such a young baby. But I think that babies are actually very tough creatures; although they are 'helpless' in the sense that they have to be fed and carried about, they are actually quite 'vivid' and vigorously healthy. At least Himi-chan certainly was! We carried with us a small food 'mill', and at each meal we used this to grind some of our own food into a paste form suitable for her to eat. Soon after Himi's birth, we had carried her about in a chest carrier, but she was now old enough to sit up by herself, so I used a light aluminum baby carrier which I wore like a backpack. She sat in this, with her head facing forward just beside mine, and I could turn my head to talk with her. On buses, trains, and while I was walking, she watched the world go by from this comfortable perch, of course also spending plenty of time sleeping with her head resting on my shoulder. Yes, I was trying to 'catch' as much knowledge and information about woodblock printmaking as I could. At this point though, I had not established any contact with actual workers in the field, people who I could watch to see how prints were made. So I thought about contacting Mr. Adachi again; he had been basically friendly on my trip two years earlier, and I thought he might let me spend some time upstairs in his workshops, watching the carvers and printers there. Himi's mother phoned and made an appointment for me and I went over one morning. Mr. Adachi seemed a bit busy, preparing for an upcoming exhibition, but sent me upstairs into the carver's room, where I found just one carver working that day, a young man appropriately named Horimoto-san (the word Horimoto could be translated as 'the foundation of carving'). He spoke no English, and I didn't speak anything but the most rudimentary Japanese, but that wasn't really too much of a barrier. In any case, I didn't intend to disturb his work, but just wanted to watch and watch and watch and make notes. I've still got my notebook, and can see the sort of things that I learned from Horimoto-san: the order of knife strokes when cutting both narrow and broad leaf shapes ... the way to hold the blade when sharpening ... how to use the kehiki with a ruler for one side of straight lines ... and pages of other points. I guess I stayed up there for a couple of hours, then said my 'thank you' and returned home. The next morning I was back on their doorstep; Adachi-san seemed a bit surprised when he saw me, but let me go upstairs again, this time into the printers' room. Here I had no chance at all to try and speak with any of the very busy men, but again filled page after page of my notebook with comments and rough sketches. And perhaps you can guess what happened next ... The third day, when he opened the door and saw me again standing there, he exploded. I had no idea what he was saying, but the meaning was quite clear, "You again! I told you we were busy! What do you think you are doing, coming back here again?!" He asked me for our phone number, and then as I stood there, called back to where Himi's mother was waiting. "Look, tell this guy that 'enough is enough'; we are really busy here and don't have time for guests ... Cheeze, give him an inch and he takes a mile! ", and he thrust the phone back at me. She was short and sharp, "Say thank you, apologize for the trouble, and GET OUT OF THERE RIGHT NOW!" I did. My diary shows that this was January 12, 1984 ... almost exactly 20 years ago ... I haven't dared ring that doorbell ever since! I should add that in subsequent years, I have met these men again: Adachi-san I see occasionally at kumiai (craftsmens' association) events, Horimoto-san comes to many of the annual exhibitions to see how I am doing, and a group of the printers also came one year, even bringing me a present of a baren for my work! But even though I've come a long way in that 20 years, there is still so much I could learn from better contact and communication with these men ... but of course, this is Japan, and everybody - including me - is so busy! A few days later, we left Japan, and the rest of the trip was pretty much pure vacation; we had open-ended 'round-the-world' tickets, and booked each leg as we went ... some time in Hong Kong, over to Germany (where I had to visit a music trade fair), then Belgium, and of course to England to spend time with Himi's western-side grandparents. Three months after leaving home, we landed back in Vancouver, and our now 10-month-old Himi-chan completed her first global circumnavigation! She has done a lot of air miles since then, and as you will read later in this issue, she's still travelling! It has been some time since I last brought you an update on the construction of my workroom downstairs; the last few months have seen quite a bit of progress though, so here are a few shots of the latest work. 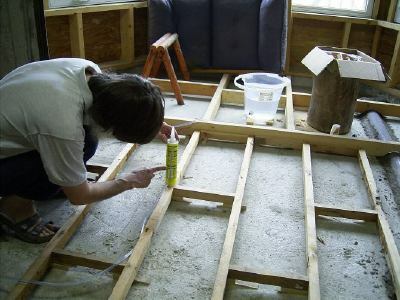 As the concrete base of this room is very uneven, the frame for the floor had to be carefully levelled. Sadako and I used a water hose system to get everything lined up properly. 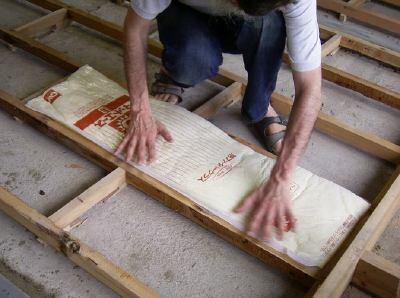 Once the frame was in place, I put batts of thick fiberglass insulation between the joists. 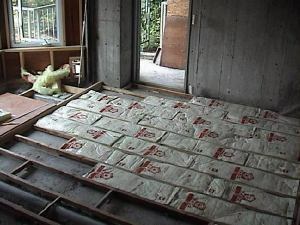 Having this much insulation under the floor should make a lot of difference in the condition of the finished room. The concrete beams are being boxed-in and will be insulated. 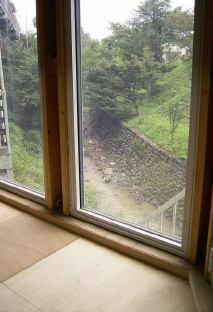 For the north-facing outer wall, I am using 15cm of a very dense fiberglass. 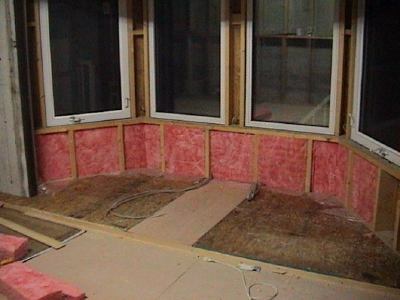 With 'house wrap' on the outside, a tight vapour barrier on the inside, and triple-glazing in the windows, this wall should be snug and draught-free! 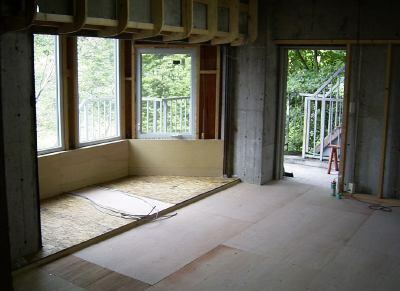 So the sub-floor is done, and the alcove is ready for the printing platform to be built. Here in Japan a huge debate on taxes is taking place in recent years as the great changes sweeping through our society are forcing the government to re-examine the basic structure of public finance. I received a letter from my local tax office a short time ago, and it contained a bit of bad news for my collectors: the regulations concerning small business exemptions from the Consumption Tax have been altered, and I am no longer eligible for such an exemption. Starting in the coming year, I will have to add Consumption Tax to the price of my prints - the 6,000 yen price will thus be increased to 6,300 yen. (Note that this will only apply to collectors resident in Japan; no tax applies to prints sent overseas). Actually, I think this change is long overdue; the exemption for small business has been much abused. Businesses with sales of less than 30,000,000 yen per year (just over 80,000 per day) have been exempt from forwarding taxes to the government - but of course nearly all of them have continued to collect the tax ... simply putting it in their own pocket. So I have had to pay such tax on all my supplies, but have never passed on that burden to the collectors. Now that I myself have to charge the tax though, that policy cannot continue. This change did not come as a surprise - we all know that the tax system is under close examination - so earlier this year I started to prepare for it by creating a new bookkeeping system for myself. For many years I have used a very simple 'honour' system for accounting; I just sent out prints and waited for people to pay for them. At the end of the year, I added up all the money received, deducted the printmaking expenses, declared the balance as my personal income, and paid income tax on it. I would occasionally get calls from collectors "David, did I pay for that print? ", but was unable to properly answer them, as I kept no records of such things. This was a bit unbusinesslike of me, but I learned many years ago that the kind of people who collect delicate woodblock prints are the same kind of people who pretty much keep their affairs in order, and who pay their bills promptly. Of course this was not a sensible policy, but I kept putting off the job of setting up an accounting system because I really wanted to do it properly but just couldn't justify the time it would take. The prospect of the upcoming tax change though, certainly provided adequate stimulus for action - nothing like the possibility of a tax investigation to light a fire under you! So I set to work studying current programming methods, and after a bit of background preparation, designed and coded a comprehensive program for my Macintosh to control pretty much every aspect of the paperwork end of my business. The program 'knows' who all the collectors are, and about all my prints, and keeps track of who is collecting what. 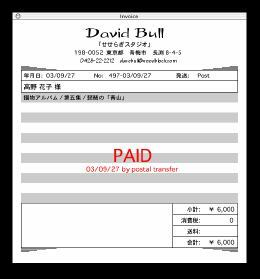 It generates all the necessary paperwork: a printout for Ichikawa-san to show her which print to wrap for each collector, an invoice for each package, the post office payment slips, and the mailing labels. 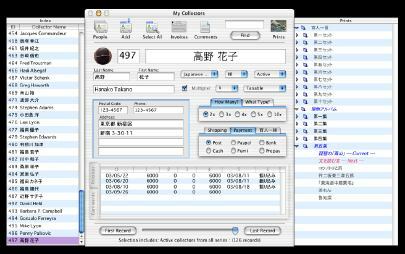 Everything is bilingual, so Japanese collectors get messages in their own language and overseas people in English. When the payments start to arrive from the post office or overseas, it is easy to match them up with the invoices. Of course, there is also a report showing the taxes to be collected and remitted once that change comes into effect. And of course, once the system was up and running I couldn't help but think back to the time all those years ago when I created a similar program for the music company. I wrote in the Halifax to Hamura story a while back "Watching the reams of invoices pouring out of the system printer is not something that I will soon forget ..." Well, now I have the same experience with my own business, although 'reams' is perhaps rather an exaggeration! Do you know the old song lyrics "The moon is so beautiful tonight; let's take the long way home ..."? Although I was only a small child when this song was popular I still thought it was a nice sentiment. My father passed away when I was a child, and with just women left in the house my mother was so worried about security that she shut and locked all the shutters as soon as it got dark outside. On those occasions when I had to stay at school so late that it became dark, I had to rush quickly home because she was so strict about this. All in all, I didn't have many chances to enjoy looking at the moon. There usually are many ups and downs during one's life and you tend to ignore the existence of the beautiful moon when you are depressed. In my case, on those occasions when I had been sad or depressed for extended times, it would happen that someone said "Look up! The moon is so nice!" Pushed by those words I would open the tightly closed window and stare at the moon. Gradually I felt the heaviness in my heart drift away and felt fresh again! David is one of those precious people for me. Many years ago, during a time when I had been down in the dumps, he once said from the other end of the phone "Have you seen tonight's moon?" I went to the balcony holding the receiver and found the big moon floating in a dark blue sky. How beautiful it was! While I was thinking back over the many conversations I have had with good friends while looking at the moon together, I realized that people look beautiful in the moonlight. David unfortunately, has the type of face that becomes half hidden in the shadows! We Japanese, on the contrary, have relatively flat faces, with a good balance between light and shadow. Wait a moment! Isn't this similar to something ...? Yes, how to enjoy woodblock prints! David says that they look best on a snowy day, or in the light through a shoji screen. Such gentle light makes subtle shadows on the printed paper. Isn't this similar to a human? I myself have no experience seeing western women under moonlight so can't make a comparison with Japanese, but perhaps our complexions have a similar texture to Japanese paper. I wonder if it was the effect of the paper screens and candlelight that caused the hero of the Tale of Genji to became so enamoured of many ladies? 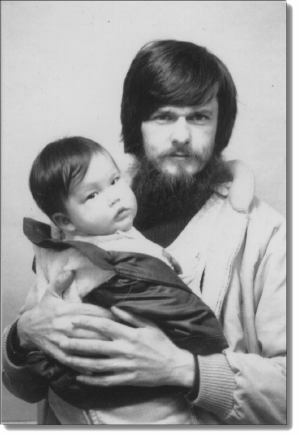 In the years after my two girls left to live in Canada, I occasionally asked them to write something for this newsletter - I wanted readers to be able to get a feeling for what kind of life they were having over there in Vancouver. In the early years they complied, and their little stories were full of information about their school life and daily activities. But they have grown older, and have become very busy with their own projects, so they are not so interested in doing that any more - in fact, I am quite sure that they no longer even read this newsletter, let alone want to write for it! 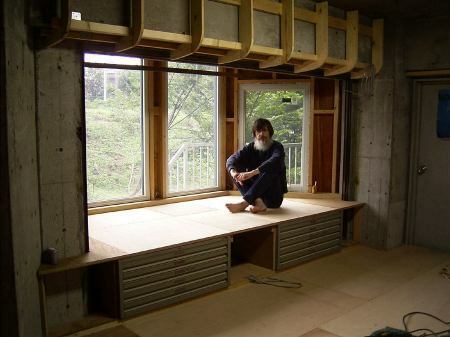 Fumi is now 18, and this September enrolled in college in Vancouver. You may remember that I told you in this newsletter last year about her business activities - selling old woodblock prints from her internet 'shop'. That was very successful for her, but when she graduated from high school, she made the decision to head for college, rather than expand her business, so she has now closed her shop to concentrate on her studies. She has no particular career goal in mind at the moment, and intends to use the college years to explore different fields, to meet people, and to broaden her outlook on the world, hoping to come across something that captures her interest. I think she has a better 'balance' than I did at that time - she seems to be taking her studies quite seriously, yet still makes time to party well with her friends (I wasn't so good at either of those activities!) She's going to a public college, so the financial pressure for me is not bad; I'm quite happy to help her through these years, and I'll be interested to see what she can 'find' there! Himi is 20, a legal adult in both her home countries, and has now pretty much 'flown the coop'. College was never a consideration for her, but it did take a bit of casting around before she latched onto something. But 'latch on' she did! A year or so ago she became interested in learning about beauty care, and attended a school to learn more about it. She became a licensed manicurist, a trade that seems to suit her character very well - a bubbly young lady who can talk easily with everybody. Finding work in Vancouver wasn't so easy, but she cast her net a bit wider, and this summer landed a position with a company that runs health spas on many cruise ships. As I write these words, she is living and working on the Carnival cruise ship Inspiration, which is making 7-day cruises in the Western Caribbean. Today is a Thursday, so the Inspiration must just now be on course for Cozumel in Mexico, after leaving the Grand Cayman Islands! She doesn't write to us very often - of course! - but I'm sure she is having a fabulous time, working hard up in the spa all day with a constant stream of clients, and then partying 'below-deck' in the evenings together with the other young people working on the ship. I had hoped to be able to bring you a photograph, but I'm sorry, I don't have one! Still, just open any travel brochure and you will see the scene - the bright Caribbean sun, the blue water ... I just hope she gets time to poke her head outdoors sometimes to enjoy it! This father is very happy with the way his two babies are growing up! As you collectors can tell by looking at the five still blank circles on the front page of this newsletter, there is no way that I will be able to get the complete set of ten prints in the 5th Album ready in time for January's exhibition. Maybe there will be eight prints there, I'm not sure. What then, for next year ... will I get even later still? Well, I think I have a good plan for next year, one that will allow me to get caught up with the Album schedule, and which should also provide an interesting 'interlude' for the collectors. The plans aren't completely finalized yet, but by the time of the exhibition I should be ready to let you know what will be happening in 2004.